Whenever Zhang Jiao plays an escape, he can select any character and have them flip a judgment. 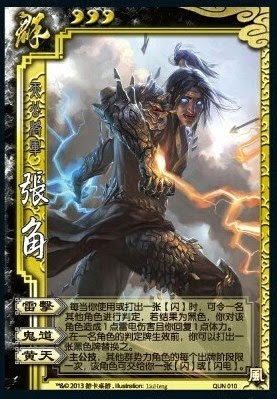 If it is black, they are dealt one unit of lightning damage and Zhang Jiao heals one. After a judgment is flipped, Zhang Jiao can discard any black card to replace the judgment card. 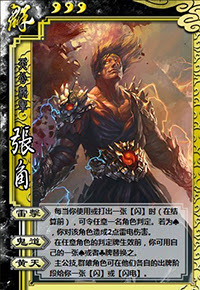 The original card that was flipped then goes into Zhang Jiao's hand. King Ability: Other heroes can give Zhang Jiao one escape or lightning during their turn. "Dark Magic" and "Amber Sky" are the same powers as the original version of Zhang Jiao. "Lightning Strike" is very similar to the original version of Zhang Jiao, but this one causes one less damage to the target and heals Zhang Jiao one as well.